In addition, OPI will be releasing Don’t Speak Pure 18K Gold Top Coat. Featuring gold leaf flakes dusted with iridescent glitter, Don’t Speak Pure 18K Gold Top Coat adds gold foil texture to nails when worn over any OPI lacquer shade. This genuine 18-karat gold leaf and glitter top coat comes packaged in a special limited edition collectable box. Just BeClaus - This magnificent maroon came into my life just in the “nick” of time. Kiss Me – or Elf! - There’s no denying the allure of this amorous red violet. I Carol About You - I just fa-la-la-la-love this deep royal purple! Christmas Gone Plaid - I sure am plaid I found this tree-mendous forest green. In a Holidaze - I’m dizzy-in-love with this maroon beauty. Love is Hot and Coal - Turn the heat up with this deep grayish brown. Fashion a Bow - So busy – all tied-up today loving this bright reddish-orange! Cinnamon Sweet - Sugar and spice…this deep, warm red is everything nice. What’s Your Point-settia? - So what if I think this is the one truly perfect holiday red? Red Fingers & Mistletoes - This smooch-worthy red shimmer is holiday-perfect. First Class Desires - This mélange of gold and eggplant shimmer is #1 on my wish list. Sleigh Parking Only - Tell the valet to take good care of this exclusive dark burgundy. Rollin’ in Cashmere - Wooln’t you just love wearing this warm, luxurious gold? Unfrost My Heart - The shimmery cool glamour of this gleaming silver is beyond hot! I’ll Tinsel You In - Black and white confetti and fine glitter adorn this ornamental glitter. Snow Globetrotter - Shake up your world with this glitter swirling with white and rainbow flakes. Comet in the Sky - Iridescent beams and midnight black create cosmic art in this glitter. So Elegant - Black and chrome confetti add sophisticated drama to this glitter. 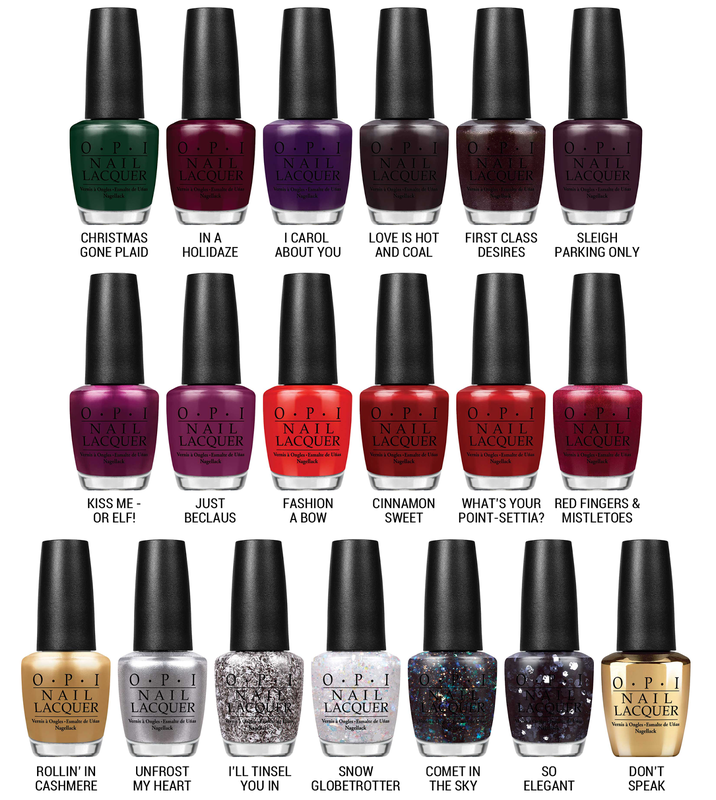 Gwen Stefani Holiday nail lacquer shades each feature OPI’s exclusive ProWide™ Brush for the ultimate in application. Gwen Stefani Holiday will be available October 2014, at Professional Salons, including Beauty Brands, beautybrands.com, Chatters, Dillard’s, Regis, ULTA and ulta.com for $9.50 ($11.50 CAN) suggested retail for each nail lacquer. Don't Speak Pure 18K Gold Top Coat will retail for $30.00 ($37.50 CAN). First Class Desires, Snow Globetrotter, and Comet in the sky! I already got a few (coughebaycough) Snow Globetrotter, Comet in the Sky, and Don't Speak. I haven't swatches them yet, but Comet looks AMAZING!!! Can't wait to see more swatches...a few sound pretty!